This soup blew my mind. This past weekend one of the ladies made this for dinner for our girls' weekend. Guys... I'm generally not a soup kinda gal. 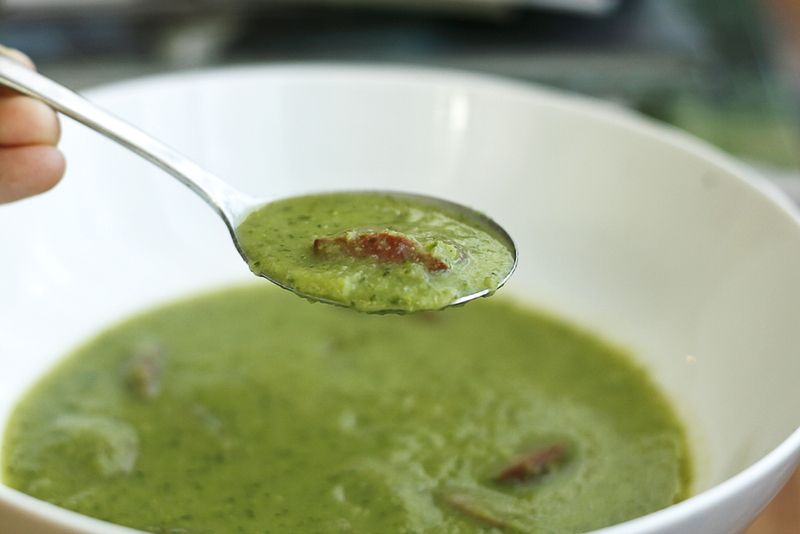 This soup rules. And it's GORGEOUS! C'mon! It packs a punch with spicy spanish chorizo. This isn't sissy, watery soup. This is smooth and filling. And really really flavorful. 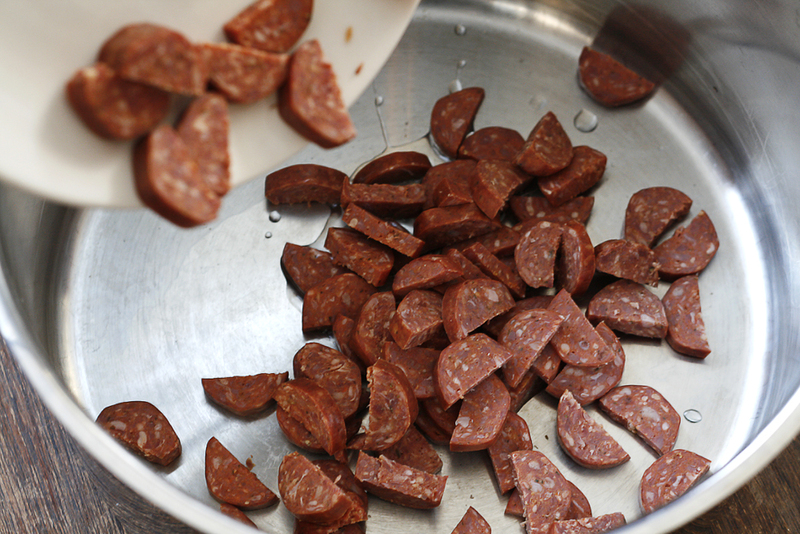 Slice and chop your chorizo and fry the sausages in a little oil. Cook them for about 2-3 minutes. 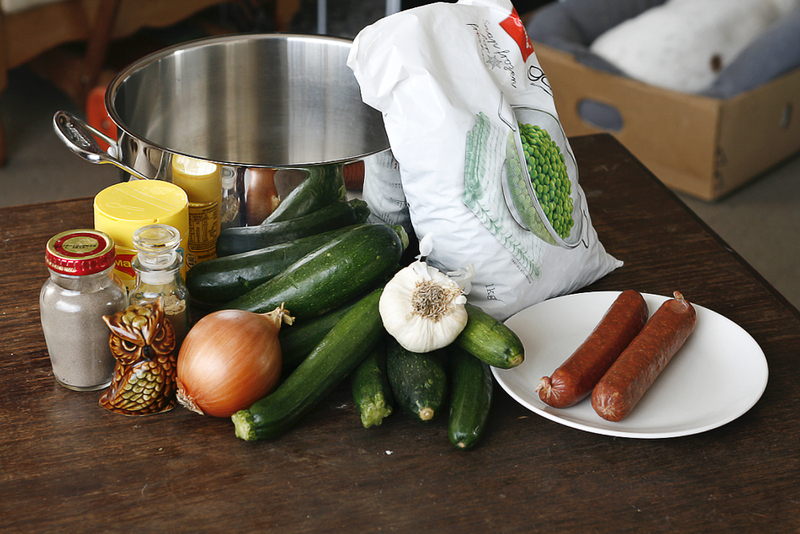 After cooking the sausages, let them drain on a paper towel to drain. Chop your onions, garlic, and zucchini. 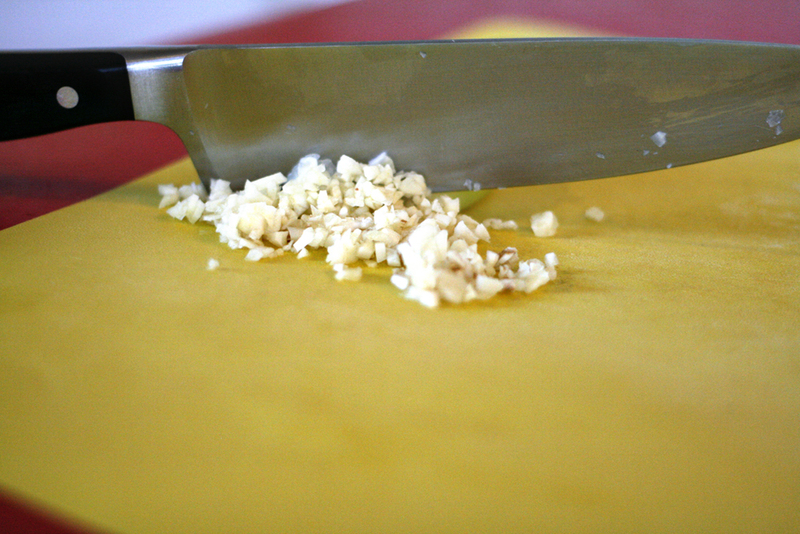 Don't worry about chopping your onions or garlic too fine since you will be processing the soup in a food processor later. Sautee the onions in the pan for two minutes. Add in the garlic, cumin, and zucchini and cook for an additional 4 minutes. Cook until the zucchini is nearly tender, but not quite done. 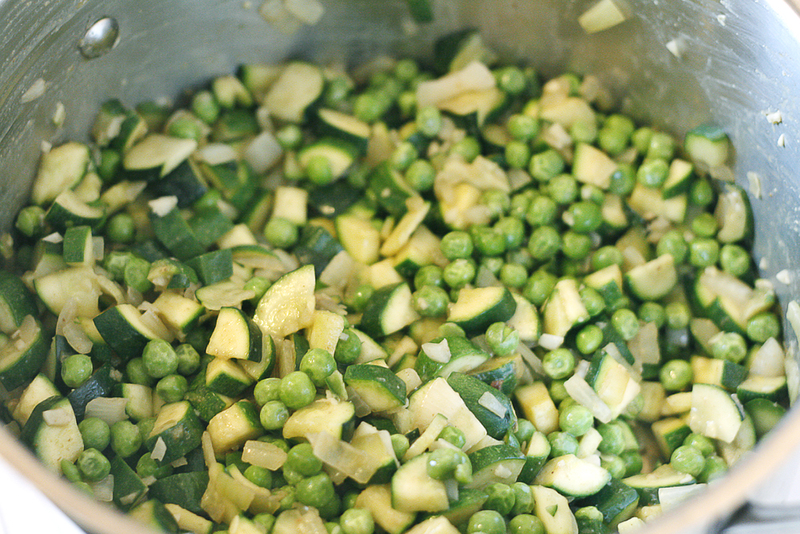 Add the frozen peas and stir around. 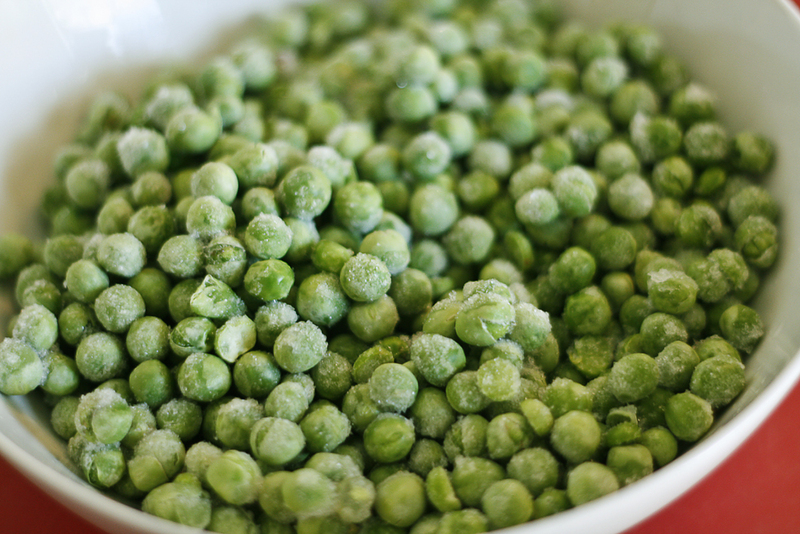 Frozen peas, guys! So easy! Add the chicken stock and bring to a boil. 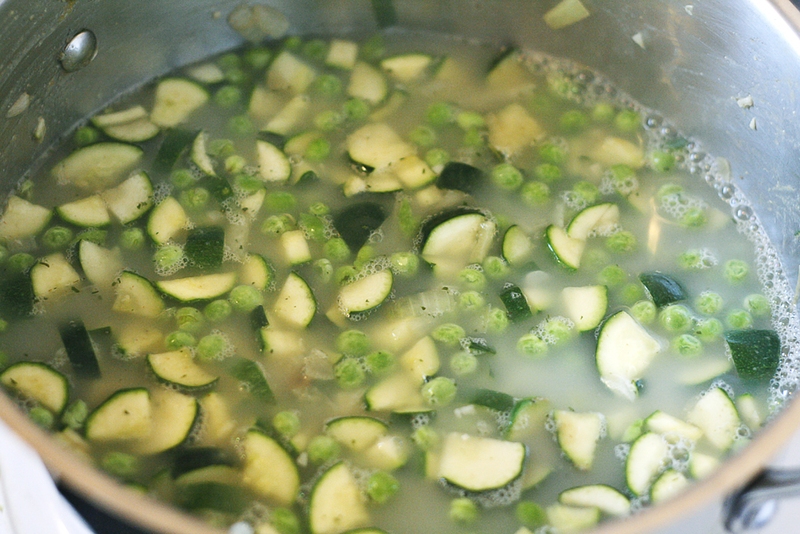 Reduce heat and simmer for 15 minutes until the zucchini is tender. Let the soup cool a bit and process in small batches. Gorgeous. Look at the color. Bring the soup back up to heat and stir in the sausage. Fry sausage in little oil. Cook 2-3 minutes and then drain on paper towel. 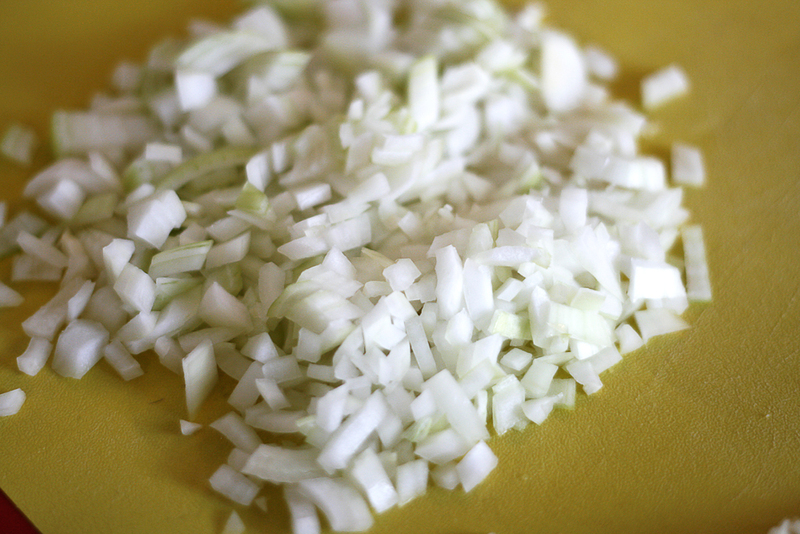 Add onion to pan and stir for two minutes. 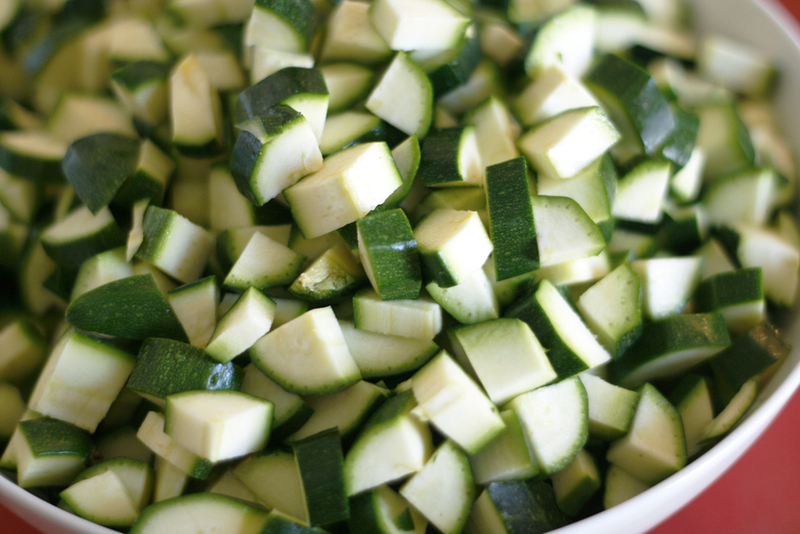 Stir in garlic, cumin & zucchini. Cook & stir for further 4 minutes. 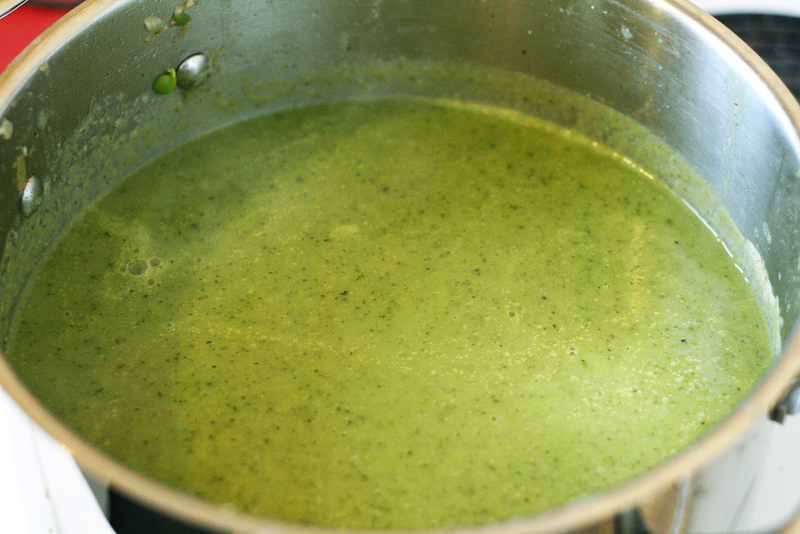 Stir in peas and stock. Bring to boil. 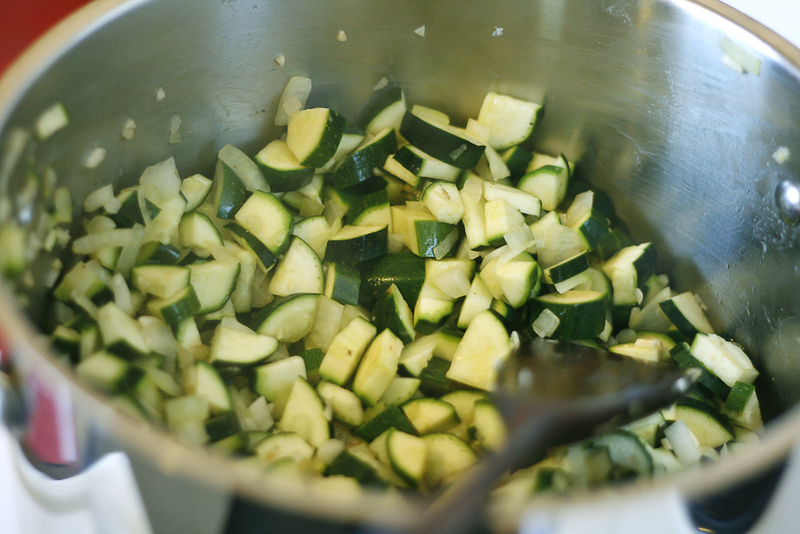 Reduce heat; simmer, covered, for 15 minutes or until zucchini is tender. Cool slightly. Process soup in batches until smooth. Place in clean pan over low heat. Cook and stir for 5 minutes or until hot. Season with salt & pepper according to taste. Stir through sausages and serve. 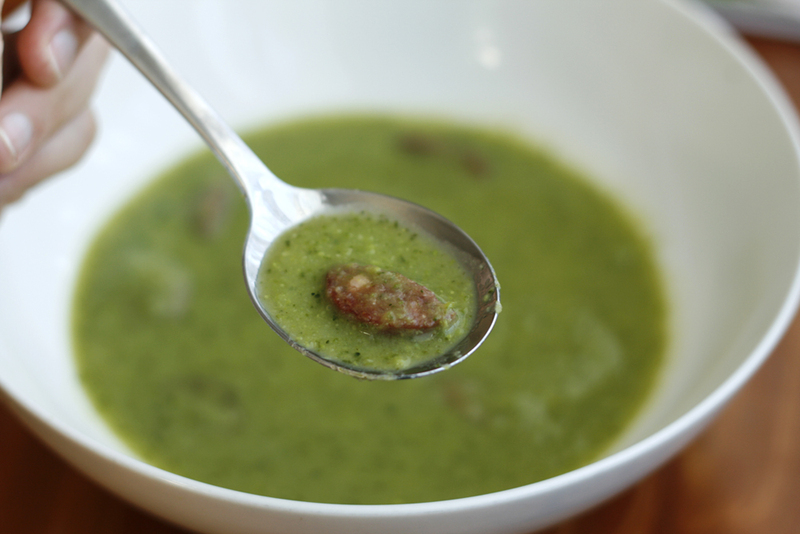 I served this soup to Audrey for lunch today with some artisan crusty whole wheat bread. That girl ate it all up and wanted more. Kid approved. And full of yummy veggie goodness. Big thanks to Josella for the recipe! So yummy! See? This is a win-win, guys. Thanks for this recipe. Sounds yummy. Ihave copied and printed it out. Well give it a go soon. This does sound delicious! I've already added the ingredients to my shopping list. yup. gonna try this too! i buy a big bag of chorizo's and keep them in my freezer - i add them to everything!! I think I'm going to follow suit. I'm kinda on a chorizo kick lately! your photos make it look exactly as it taste's Talia :-) Beautiful! Thanks for sharing the recipe, Josella! Audrey and Phil both really loved it! I took the rest of the soup to an Autumnal Harvest potluck last night and it went down a treat. I'll be making this for sure! Look at all that green!! Love it. The green is my favorite part I think... It;s so beautiful. And I love knowing that it's filled with veggies. Good for you! Awesome!! Thanks for the tip! This sounds and looks delicious! I bought the ingredients at the supermarket lastnight and I'm about to dig in and make it for the girls' and my lunch (and then have the even better version tomorrow :) Thanks for sharing it! To quote Rachel Ray: "That's what's for dinner tonight!" 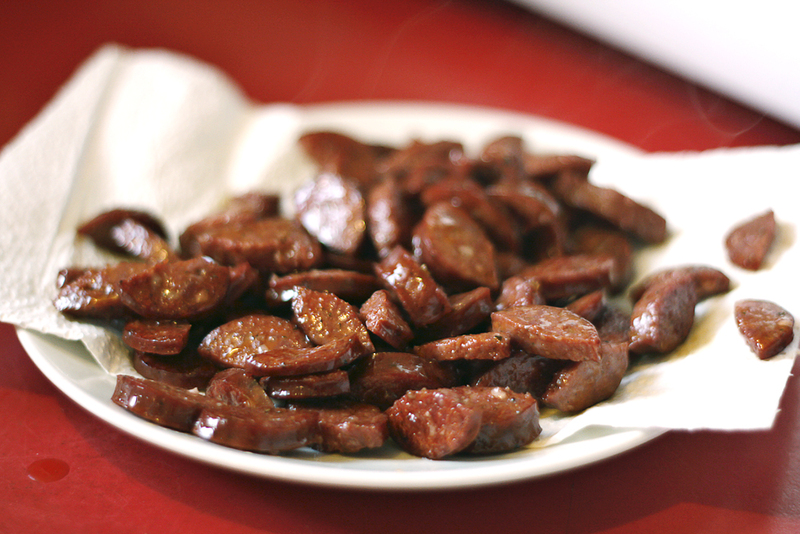 - looks and sounds delicious, and I think the chorizo will placate my carnivorous husband! Two bowls each for my veggie-avoiding 2yo and meat-lovin' hubby...it's a winner! Love the contrast of sweetness from the zucchini and peas, with the spicy chorizo (although I think I preferred it sans chorizo). Thanks so much for sharing the recipe - I'll definitely be making it again (and again...and again...and again...)! OMG this was delicious!! Thanks so much for sharing it. I have a big group coming over this sunday, so I think I will make it. Who knows, one of Phil's brothers might get a taste! ?